First-time nonprofit managers can often use a bit of guidance from more experienced colleagues, as well as the answers to specific questions. The problem is, there just aren’t enough mentors to go around, and perhaps this is especially so in the nonprofit sector where resources are stretched to the limit. What’s the solution? Well, Third Sector New England believes it’s found a partial solution at any rate — TSNE is spreading the available expert guidance to a wider audience by putting its “mavens” on video and on the Internet. Denise Moorehead of Third Sector New England, videographer Steve Garfield, and Deborah Elizabeth Finn have put together a number of short videos segments in response to frequently asked questions about finance, human resources, program evaluation, diversity, and fiscal sponsorship for nonprofits. What is the difference between a nonprofit organization’s mission and vision? 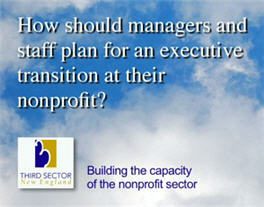 How would you define capacity building? What are the priorities for a new executive director’s first three months? Why should a nonprofit care about “theory of change”? What are the top three actions a board should take when the executive director resigns? The plan is for the mentorship videos to be arranged in an FAQ format, forming the basis for a web-based video resource tool for new nonprofit managers. That sounds like a great resource! Steve and Deborah rock, too, so I'm sure it'll be really good.